The newest internet sensation – this is how some product reviews call the Vizeri Tactical Flashlight, also known as the VZ230. Thanks to the bunches of positive reviews from Amazon – this handy device is now selling from the website shopping platform itself. The VZ230 uses the CREE XP-G R5 LED technology, an innovation that has been used several years ago. When set on high setting, it gives off 230 lumens; while on medium and low, it emits 70 and 20 lumens respectively. For more convenient operation, this Vizeri Tactical Flashlight remembers the last mode you used. The device also comes with a zoom lens, IPX-7 certified waterproof exterior, and aircraft grade coating in aluminum material. As soon as you pick up this light, you’ll admire its quality and hard anodized finish. The solid and compact exterior is made with strict attention to detail, giving it a light, sturdy, and dependable ensemble. It may be small, but the light it delivers is unbelievably bright. The battery life is also impressive, which is proven to last 3 times longer than other flashlights in the market. Common applications of the VZ230 are camping, fishing, caving, hunting, night hiking, trips in the wild, jobsites, law enforcement, biking, mounting weapons, and even self defense. Simply put, the Vizeri VZ230 is the perfect survival you will ever need, even in the most trying situations. AAA batteries – Regular or alkaline, the VZ230 can make use of these batteries with no issues. Rechargeable Nickel-metal hydride (NiMH) batteries – These revolutionary batteries do not make use of heavy and toxic metals. They also store 50% more power when compared to nickel-cadmium batteries. This flashlight has a rear switch, which controls pretty much everything. Easy to operate, it only needs one long press and it will illuminate. A soft, half press at the tail switch, on the other hand, will let you navigate through the five different modes of the VZ230 – SOS, strobe, low, medium and high strobe. When you switch the light off, the last setting will be remembered by its memory feature. However, the feature only works when it’s been turned on for more than five seconds. Another breakthrough feature of the VZ230 is the ZOOM. To enable, simply twist the ring to make the head outspread to about ¼ inch. Even when twisted, you can stop and use it any time. The good news is, it stays where it is, unlike telescopic lights that do otherwise. As for the disadvantages, there are not much to mention, as long as you are using it on in high strobe. However, there is one thing to note when using it in low and medium mode. Since it is not controlled by current, a phenomenon called PWM (Pulse Width Modulation) occurs. When this happens, fast moving objects show as multiple images. But as stated above, this only happens when the flashlight is set on low or medium mode. Based on product reviews, features, specifications and cost, we can say that the Vizeri VZ230 makes a good investment. Despite the PWM issue, the accessories, impeccable material and light quality show that it deserves the 4.6 star rating in Amazon. Probably the biggest selling point of this flashlight is its memory feature, which is efficient in recording user’s last preference. Another favorite is the ZOOM, which allows the user to stop at any point and still get an illumination. For best results, our recommendation is to use rechargeable batteries whenever possible. Vizeri VZ230 is backed by a lifetime manufacturer warranty and no-risk money back guarantee. Optional accessories include remote switch and bike mount that’s perfect for night bikers and adventurers. Whenever you are out looking for a tactical flashlight, the three most important things that you would usually consider would be the quality, functionality and the price. With a plethora of flashlights that you can find online and even in the stores, you would often bump into confusions along the way, especially when you do not have enough knowledge about the product. If you are on the hunt for the best tactical flashlight that you can use for a variety of purposes, the Vizeri Focusing Tactical Flashlight got you covered. It can be a bit hard to find a tactical flashlight that is not only efficient but economical, too. 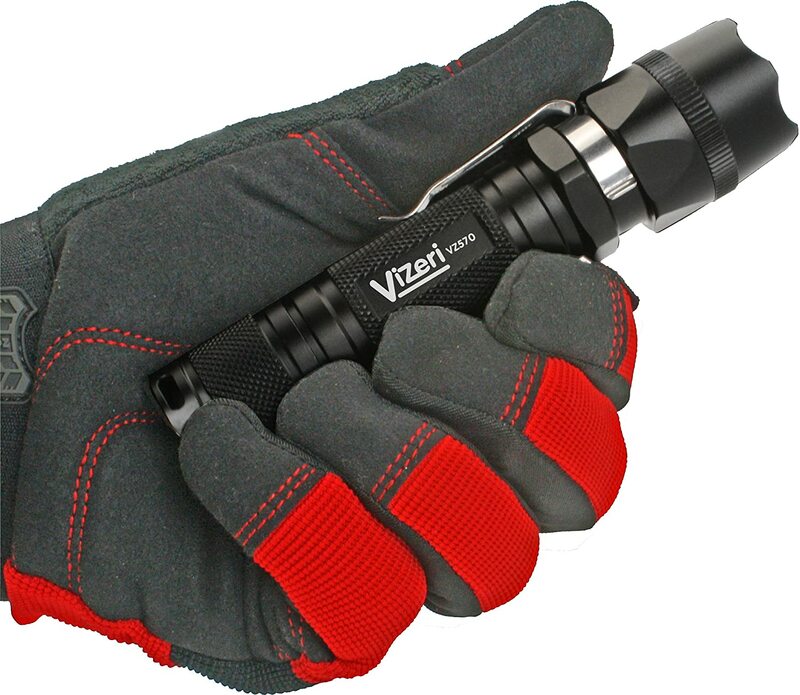 With the Vizeri flashlight, you are sure to get both qualities and even more. Consumers have attested when it comes to the finishing of this flashlight, from the hardened anodized finish up to its military grade aluminum body. It offers high intensity light that you can use for a lot of purposes, may it be for photography, camping, law enforcement, security, military, army or even for emergency uses. There is simply no limit as to how far this light can go or how compact and reliable it can be. Vizeri offers two different models for this tactical flashlight, these are the VZ230 and the VZ460. Both offer impeccable output that you cannot just compare with any other. The VZ230 has been quite an internet sensation since it was first introduced, thanks to the numerous positive reviews that were made by consumers who have already purchased it. Armed with the CREE XP-G R5 LED technology, you will get 230 lumens on high setting, while it can give off 20-70 lumens on low to medium settings, respectively. A lot of users find this flashlight convenient and easy to use, even for beginners. The flashlight remembers the last mode that you used so you can always choose to stick with it especially when you are in a rush and do not have enough time to set a particular mode. This is very helpful when in an emergency situation. Apart from that, the flashlight also comes with aircraft grade coating made of aluminum, IPX-7 certified waterproof exterior and a zoom lens. When you want superior light output without having to spend for too much, the VZ460 from Vizeri is something you ought to consider. This model offers double the lumens of the VZ230 but is also armed with significant benefits that you cannot just ignore. This flashlight uses the CREE T6 XML LED technology with five different modes to choose from – SOS, Strobe, Low, Medium and High. You cannot compare this model with those cheap flashlights anywhere, as you can find that all the components are threaded into the tube and not just pressure fit. The kit also includes a holster with D-ring, lamp diffuser and a carabiner that you can use in creating a hanging lamp whenever you are camping or doing anything outdoor. There are also lots of accessories that are included such as the orange diffuser, weapons mount, lithium batteries, remote tactical switch and a bike mount. Another advantage of the Vizeri focusing tactical flashlight would be the different power options that you can use to keep the light on for as long as you need it to be. If you have a lot of time to spare, you can charge your lithium-ion batteries before using them for the flashlight, or switch to AAAs whenever you want to. You can also use CR123 alkaline batteries or 18650 litium-ion batteries that are also rechargeable. Other batteries that are compatible with this flashlight are 16340 lithium, rechargeable 18350 IMR-type batteries and also the Nickel-metal hydride ones, or those called NiMH. These are indeed helpful and low-cost options that you can choose from depending on the situation and your preference. With all these notable features and specifications, you can see that there is no reason for you not to consider this flashlight in case you are planning to buy one. Aside from it being easy to operate, it is also cheap compared to others. VZ230 retails for only less than most tactical flashlights on the market while the VZ460 for less than other high end brands. Another advantage is its Lifetime Manufacturer Warranty which only proves that this company is truly committed to providing nothing but the best quality with every flashlight they make. In case something is not functioning right or you think the flashlight is not delivering what it promises, you can always contact the company anytime and they are sure to help you out. Basing on all these info, you can simply say that the Vizeri Focusing Tactical Flashlight is indeed a good investment. With the generous inclusion of accessories, light quality and impressive material, you are definitely getting more than your money’s worth, and you don’t even have to pay for so much just to get what you truly deserve. For an outdoor enthusiast, having a flashlight that is well-made and totally useful is a necessity. This goes the same for those who are working in the law enforcement and military. A tactical flashlight is indeed something that you can carry around wherever you go, providing you with the light that you need, as well as some other benefits. For people whose jobs do not require carrying this gadget around, you may ask, why go for a tactical flashlight? This flashlight can be considered as one of the things that you ought to have in your survival or emergency kit. Let’s say you are in an emergency situation and there is only but darkness everywhere. With the brightness you have in your flashlight, you can use it to visually signal your location. Another circumstance is that during a natural disaster, the flashlight can greatly help in leading you to the right way in the middle of the dark. For personal safety, on the other hand, is another purpose of this equipment. You can use the bright light to blind your assailant or attacker which will save you precious seconds or even minutes so you can have the chance to escape. If you ever get stuck in the dark and you have no one else with you, you can rely on your flashlight to be your guide. FBI states that most violent crimes would usually happen at night, in the dark. 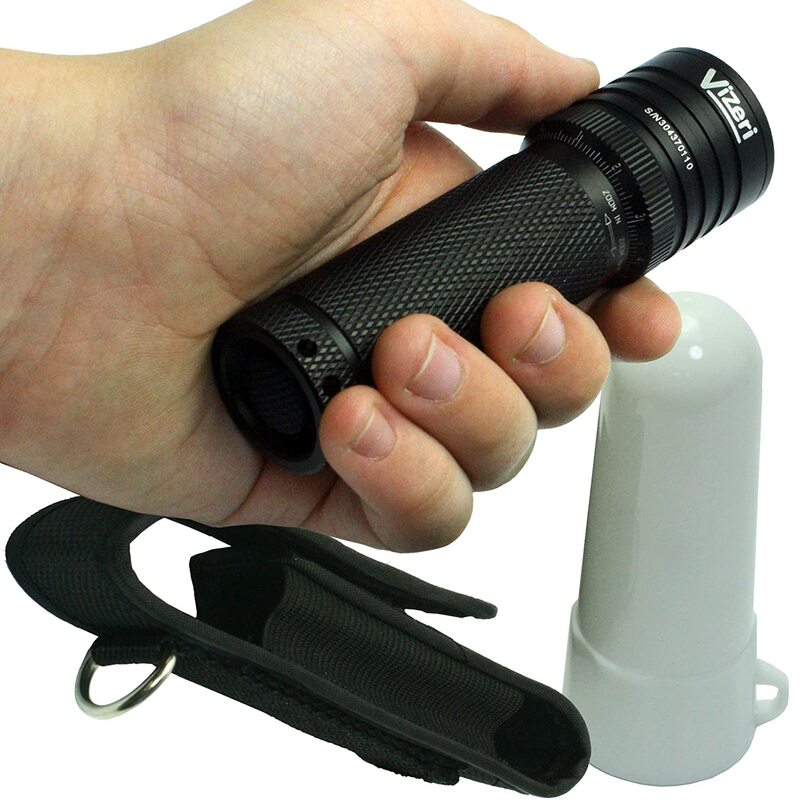 Among the most popular tactical flashlights would be the Vizeri CREE High-Lumen . This intensely bright gadget can put out up to 570 lumens – this intensity is pretty much equivalent to more or less 63 incandescent double D-cell flashlights combined. What’s even more impressive is that this flashlight can actually offer usage of up to 1.5 hours despite the high power it can give. There is question when it comes to Vizeri’s durability and quality. This tactical flashlight comes with 100,000 hour LED and also features T6061 aircraft-grade aluminum alloy tube that serves as a help for impact resistance. You are also assured of IPX8 waterproof rating because the flashlight comes with silicone o-rings. Other specifications include the gold plated connectors that are essential for anti-oxidation, the AnoShieldTM premium Type III hard-anodized anti-abrasive finish, ultra hardened tempered glass lens that feature anti-reflective coating and also military-precision machined knurling and threads. One can immediately notice the Vizeri LED CREE High-Lumen tactical flashlight’s compact design and classic style. You can easily carry it around inside your pocket as it only measures 5 inches long. The flashlight comes in five different modes, SOS, Strobe, Low, Medium and High. There is also a tailcap switch that controls the on and off buttons, and upon turning on/off the last mode that you used is stored and immediately activated. Batteries are not included upon purchase so be sure to buy your own. Just one 18650 lithium-ion battery which is also rechargeable, or you can also choose to use 2 CR123 batteries that are readily available. As for the accessories, you will also get a stainless-steel belt clip that is removable, a red silicone switch cap replacement, a space o-ring and a lanyard. Note that there are already holes available in the tail-cap for lanyard use, or you can also just hang it around. There will also be a remote switch and extension tube that are both optional. The extension tube can be used for extended lighting thru the use of dual 18650 batteries. Although most flashlights will ideally have similar features, particularly the main ones, there will always be a difference in terms of power and quality. So if you are on the hunt for your first or perhaps next tactical flashlight, there should be just a few things that you will need to consider. First off, take a look at the output power. Do you want higher lumens or no? For what purpose are you planning to use it? You should also think about the lifespan of the bulb. LED lights are economically beneficial, considering the fact that they offer longer lifespan compared to other alternatives. Longer lifespan might mean that you will not have the need to buy a replacement or bring spare bulbs with you. Other factors to consider would be the bezel, reflector, lens and the light source. You can check this in depth tactical flashlight reviews. Other buyers will surely think about the price of the flashlight, as well. Everybody wants something that does not only perform efficiency, but also allows them to save money on the side. So, for your next purchase of a tactical flashlight, be sure to remember these guidelines to make your decision easier and faster.